Is this the Most Significant Inscription from Hadrian's Wall? 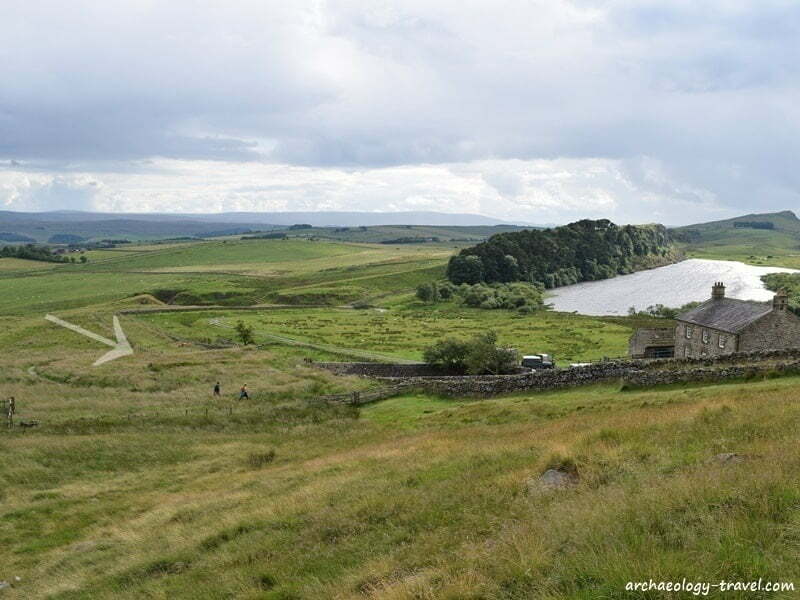 Today there is no doubt that the Emperor Hadrian built the Roman wall running across northern England. Ancient historians, antiquarians and archaeologists, however, have not always been as certain as we are now. Before the mid 19th century others were credited with having built the wall. The inscription on the stone below, now on display in Newcastle’s Great North Museum, changed all that. This stone confirms that it is indeed Hadrian’s Wall. The inscription that confirmed Hadrian ordered the building of the Wall. In popular imagination Hadrian’s Wall is a stone wall stretching from coast to coast a little south of the Scottish and English border. And up until at least the 1850s it was thought that Septimius Severus, the Roman Empire’s 20th Emperor, built the wall during his failed attempts to finally bring all of Britain under Roman control. Hadrian was credited with building what is called the Vallum. For those unfamiliar with Hadrian’s Wall, clearly there is more to it than just a stone wall. 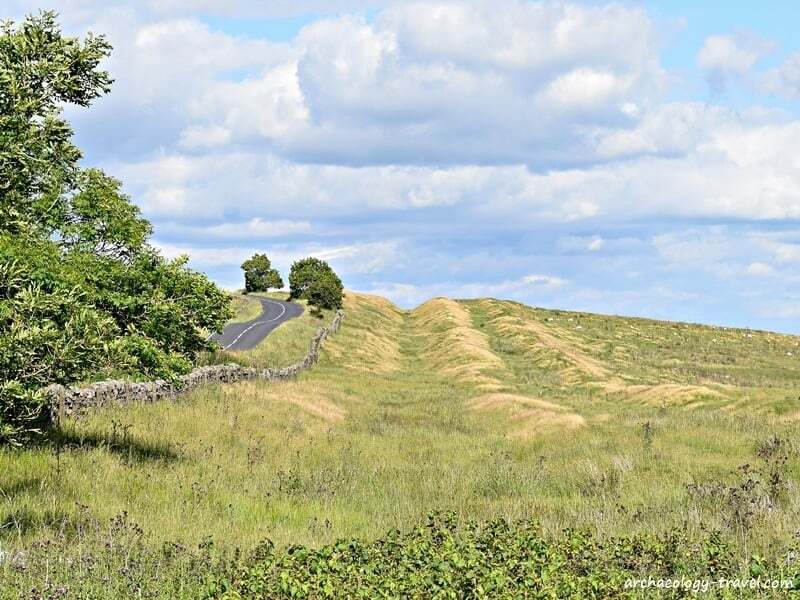 Besides the stone wall with its forts, milecastles and turrets, the defensive system also included a series of earthen ramparts and ditches, or vallum, that lies to the south of the stone wall. Briefly, the vallum was a large ditch about six metres wide and three metres deep, and would have had a flat bottom. This ditch was flanked by two mounds of earth (called the north and south mounds respectively), six metres wide and two metres high, about nine metres away from the edge of the ditch. A third, smaller mound of earth was added along most of the length of the vallum. This is known as the marginal mound as it was constructed on the southerly edge of the ditch. Once you know what you are looking for, the vallum is easy to pick out on the landscape. The main features of the wall can be seen in the three photographs below. The first shows the stone wall itself, that part of the frontier structure that gets all the attention – along which hikers love to walk. In this section of the wall you can see the foundations of a turret. There were two turrets between each milecastle, which as their name implies were placed at intervals of one Roman mile along the length of the stone wall. A few metres to the north of the wall there was a ditch, which can be seen to the left of the wall in the photograph below. The second photograph is taken from within the vallum looking into the ditches and mounds – this is my photographic attempt at providing a cross section of the earthwork. The ditch with the marginal mound and the southern mound is clearly visible, while the northern mound has been obliterated in this section by the road that is on the northerly edge of the ditch. 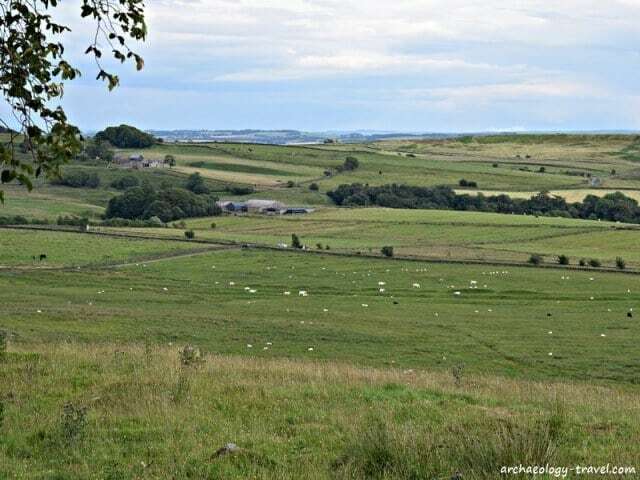 In the third photograph you can see the vallum running left-right (east-west) through a field in which sheep are grazing. The stone wall and ditch at Black Carts Turret. The vallum from above Crag Lough. 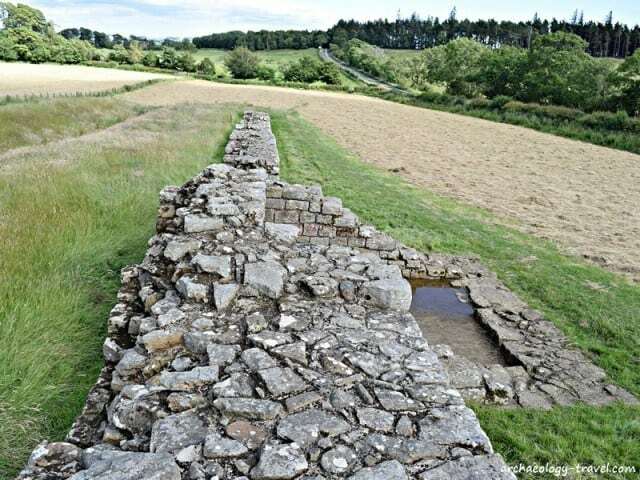 Before being called Hadrian’s Wall it was known as Severus’s Wall. The issue of ‘authorship’ is a detail that is largely ignored nowadays. Which is unfortunate, because changing ideas about who built the Wall is more than a matter of historical detail to be consigned to a footnote. British scholars misidentified who was responsible for the Wall because they still fell for the political spin that came out of Rome after Severus’s death many centuries later. In his 1802 History of the Roman Wall, Which Crosses the Island of Britain (published by J. Nichols and Son, London) William Hutton presented what is the earliest and then most detailed chronology for the construction of the wall. He suggested that the vallum was the work of Gnaeus Julius Agricola (the General largely responsible for the Roman conquest of Britain) and Emperor Hadrian. More specifically, that Hadrian added the ditch and north mound to Agricola’s marginal mound and south mound. According to Hutton, the stone wall was built by Septimius Severus – the 20th emperor of the Roman Empire. For example, Aurelius Victor writing circa 369 states “after driving out the enemy, he fortified Britain, as far as it was useful, with a wall led across the island to each end of the Ocean.” (Liber de Caesaribus Chapter 20). In the same year Eutropius in book VIII, chapter 19 of his Breviarium Ab Urbe Condita says “He had his last war in Britain, and so that he might protect the recovered provinces, he led a wall for 133 miles from sea to sea.” The same idea was repeated by Jerome ‘Chronicon’ around 380, but with a revealing difference: “Clodius Albinus, who had made himself Caesar in Gaul, having been killed, Severus transferred the war to Britain, where, to make the recovered provinces more secure from barbarian invasion, he led a wall for 132 miles from sea to sea.” The wall was in fact 80 Roman miles in length, not 133 or 132. An anonymous account written around 395 AD in chapter 20 of Epitome de Caesaribus gives a clue what was going on: “He led a wall in Britain for thirty-two miles from sea to sea.” The later accounts were almost certainly simply transcribing earlier accounts, hence the error in the length of the Wall and similarities of expression. This begs the question why these writers credited Severus not Hadrian? One writer does in fact credit Hadrian: “having reformed the army quite in the manner of a monarch, he set out for Britain, and there he corrected many abuses and was the first to construct a wall, eighty miles in length, which was to separate the barbarians from the Romans.” That was Aelius Spartianus writing in Historia Augusta (Chapters 10 & 11 deal with Hadrian). Hadrian never conquered the land to the north of the wall, that is Caledonia – what is today Scotland (although the actual border between England and Scotland is a little further north of the Wall). Hadrian’s activities here, as elsewhere on the Empire’s borders, was to consolidate the Empire. Later, however, Severus was determined to conquer Caledonia, and bring the region into the Roman Empire. At various points in his ongoing campaign the Wall would have been a crucial asset to Severus, and it is highly likely that he had it repaired and restored where such was required. Unfortunately for Severus, his campaign in the north of Britain would be his undoing – he died in York in 211 AD. Severus’s attempts to bring Caledonia into the Empire were taken up by his son and successor Caracalla. Caracalla was no more successful in subjugating the Caledonians than his father. Disillusioned he retreated to Rome, where it is thought he set about to ensure Romans believed he and his father had achieved their objectives. For Hodgson this inscription is the evidence required to show that that the wall was built by Legionaries who were under the command of Aulus Platorius, the then Governor of Britain, who was in turn under orders from Emperor Hadrian. Other supporting inscriptions have since come to light (some of which are also on display in the Great North Museum). A decade later, the archaeologist and renown Wall scholar John Collingwood Bruce in 1851 published the first edition of his book titled The Roman Wall. He was in no doubt that the wall was built under Hadrian’s orders, and that Severus only had it repaired where necessary. Later excavations of the vallum, the first of which took place in 1893, showed beyond doubt that the various components of the vallum were in fact contemporary. The vallum was constructed as a single unit. Although there is still some doubt as to why it the vallum was constructed, it is widely accepted to have been constructed shortly after the stone wall was built, not before it. And of course we now know that work begun on the Wall in 122 AD, long before Severus’s time there. Where was the Inscribed Stone Found? The inscribed stone was found near Milecastle 38, which is right next to Hot Bank farmhouse and its barns. Of the milecastle there is not much to see now. The Hadrian’s Wall path goes around it, but I am sure very few walkers even notice the overgrown walls of the fortlet. It was not very big, about 12 metres square. It is barely visible in photographs, but the outline of the milecastle can be seen from above, zoom in on the green marker in the Google map below (the position of the vallum is marked in yellow). The arrow points to the overgrown Milecastle 38. This inscribed stone may not be the most exciting artefact on display in the Great North Museum, but it is certainly one of the most important. 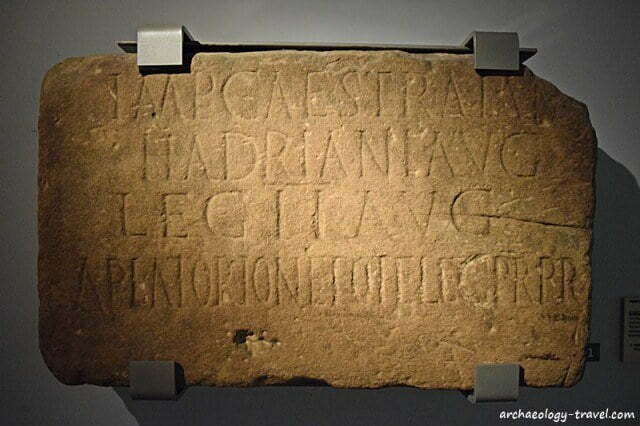 The inscription itself is certainly the most historically significant in the study of Hadrian’s Wall. This blogpost was researched based on the following presentation by Professor David Breeze of Durham University.